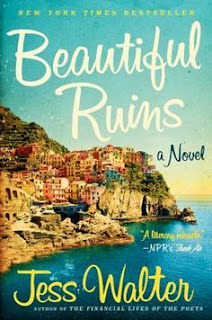 Beautiful Ruins by Jess Walter begins in 1962 in the beautiful Cinque Terre section of northern Italy with a few scant homes and one small hotel clinging to dramatic cliffs in a small village overlooking the Ligurian Sea. This picturesque setting is where we meet innkeeper Pasquale Tursi who welcomes an American actress, Dee Moray, working on the movie Cleopatra being filmed in Rome. We quickly discover that the actress is dying. It is this brief three-day encounter that sets the stage for the rest of the book that takes turns explaining the backgrounds of people who were in some way connected to Pasquale and Dee, directly or indirectly with regards to this timeframe. The book is a reminder that sometimes the lives we briefly touch can stay with us a lifetime. In the chapters that flip from 1962 to present day, we learn that nothing is black and white; all is not what it seems. As we read on, each person’s story slowly develops like a roll of film until we see the entire picture in full Technicolor. I really enjoyed this book (as did one of my sisters who read it). The beautiful cover was my first hook. It looks like an aged picture of a sunny Italian coastline with a burst of colorful homes jutting out of the rocks. And while you can’t judge a book by its cover, it creates a powerful first impression. It already makes me want to dive in and take a journey there. The narrative, of course, is what urges me to keep turning the pages. Jess Walter beautifully and effortlessly weaves together disparate lives into a full and rewarding story with surprises, humor, and heartbreak along the way. I give it an enthusiastic thumbs-up. My book club added this to our list after I had already read it. Consensus: Everyone loved it. No surprise to me, of course. One member mentioned how at the very beginning she was a little startled at how abruptly the chapters switched to a totally different place and time, but that uneasiness dissipated and she quickly fell into the rhythm of the book.